Just a reminder wherever you are on this beautiful planet, go out this Saturday and support your local record store – it’s World Record Store Day! It doesn’t matter if you don’t have a turntable or even a CD player. The reality of running a bricks and mortar business in the 21st century means that you can buy not only CDs and vinyl at stores but also t-shirts, posters, books about musicians and other music related things. 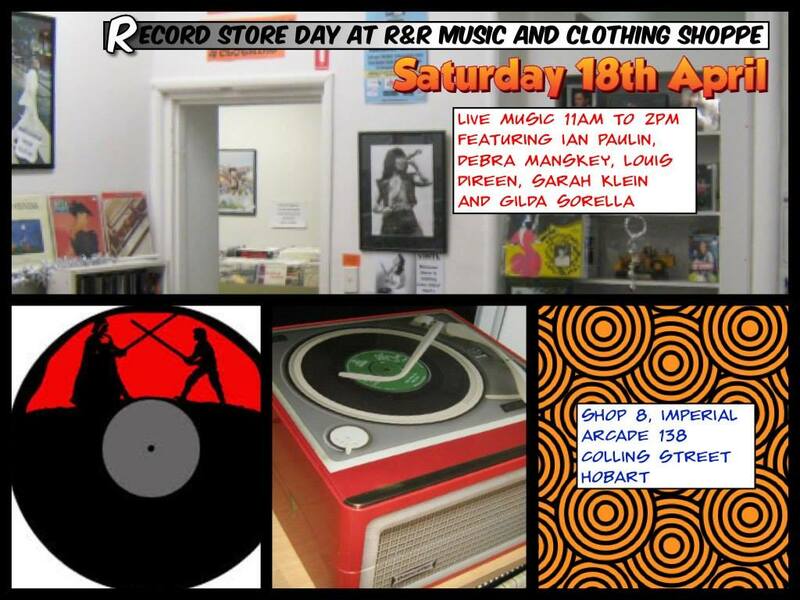 I’m heading to one of Hobart’s hidden treasures, R & R’s Retro Music and Clothing Shoppe in the Imperial Arcade, off Collins Street in the city (shop 8/138 Collins Street, Hobart TAS 7000). The owners, Ross and Rhonda are much more than just business people. They’re truly passionate about music and in particular, supporting local Tasmanian artists. They have things in their shop that hark back to my misspent youth and my earliest times exploring the Tasmanian music scene as well as new work by emerging and established musicians. If you live outside Tasmania, call them to ask about their extensive catalogue (03) 6224 4891 or 61+3+6224 4891 if you’re overseas. For locals, if you’ve got any Wild Pumpkins at Midnight recordings, posters or memorabilia, please bring it along and I’m happy to sign it, coo over it and generally reminisce. Hopefully, see you there!